Happy Fourth of July everybody! Atlanta has seen unseasonably high rainfall in the past month. A normal July would have our grass crunchy and brown, but this year it’s green and growing like crazy (hooray!). It’s even raining right this second, as it has been for the past 24 hours. Flash floods are popping up everywhere and we don’t even blink anymore when our phones chirp with weather alerts. We get it, it’s raining out there… a lot. 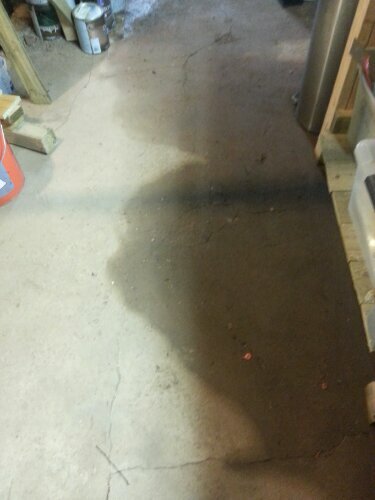 We even had a little flash flood in our basement crawlspace this week – very exciting! When I pulled into the driveway yesterday afternoon, the first thing I saw was Robby with a sledgehammer. 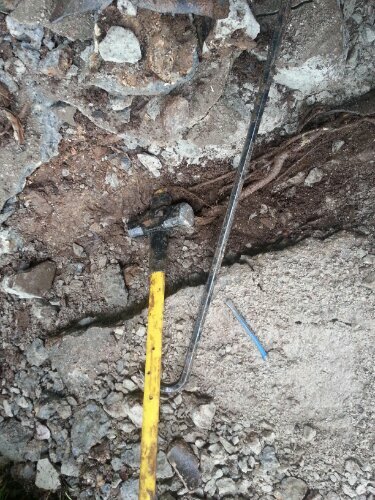 A sledgehammer! That’s a first. He was busting up the sidewalk above our evidently broken drainage pipe that runs along one side of the house and goes under a short set of stairs. When unimpeded, the pipe allows water that’s flowing downhill to get under the stairs and flow out the other side. 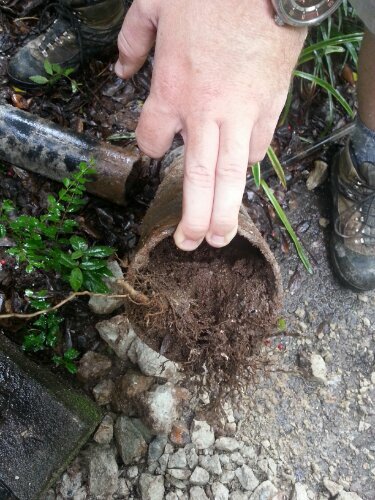 When Robby busted up the concrete above it and pulled the pipe out, we found that it was clogged with roots and dirt and critters. So the water had to find another place to go, which turned out to be the basement. 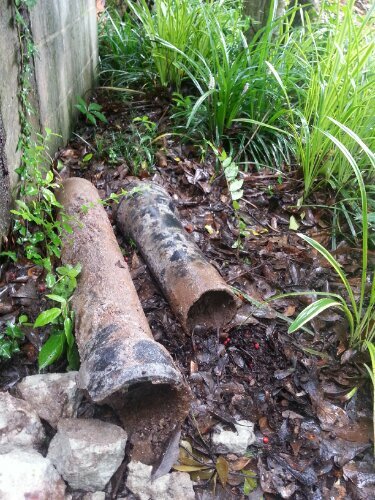 The plan is to install a new PVC pipe, which should be impervious to future root damage. 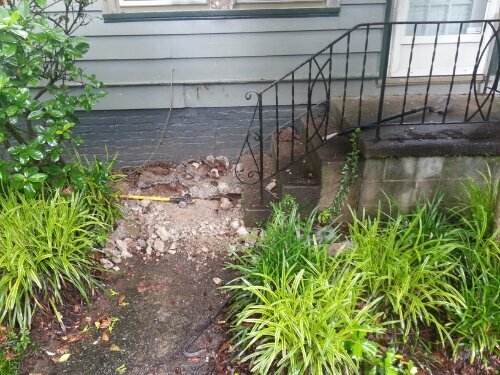 First, the rest of the concrete will be busted and removed. We’ll probably replace it with pea gravel once the new pipe is in place, for aesthetics and easy access to the new pipe in case of any more drainage issues. Fortunately we weren’t planning on any big Fourth of July festivities, because this repair should take several hours to complete. 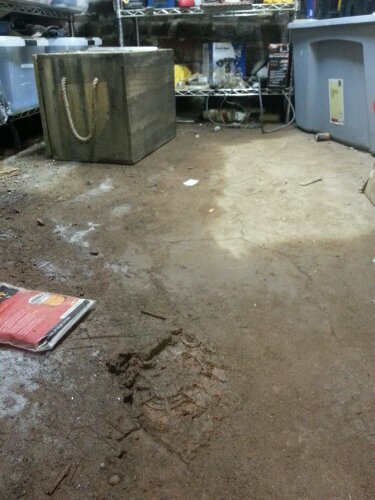 We hope that once the pipe situation is resolved, we’ll have a dry basement when it rains.